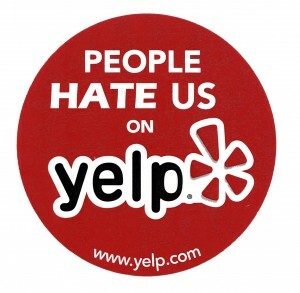 For those businesses that we have talked to over the years complaining about the tactics Yelp has used to allegedly extort money to try and hide reviews, your redemption, or at least a degree of satisfaction, may be near. ValleyWag magazine has reported that the tactics used by Yelp have now resulted in a lawsuit that may have rather dramatic ramifications. The lawsuit is coming from the investors themselves when they learned the tactics used to make the money for the company. They also learned that many of the leaders of the company sold out before it was all revealed and that raises all kinds of problems for them. Apparently the so-called transparency of the company to the investors was quite opaque in a few areas. The hope here is that all of this will result in a company that will deal with local businesses the way they should and not resort to unethical tactics to line their pocketbooks. If you or I did such things it would result in jail time. Let’s see if someone is truly held accountable for these things. The other best option is for each company to take control of their online reputation and we can recommend the 5StarMax system to generate positive reviews by promoting them all over the internet and social media. The negative ones can be handled in way that the customer feels appreciated and needed and turned into a fan if they once had a negative experience. Call today at 800-766-0059 to see what needs to be done to improve your online reputation. Kelly Smith has a Masters Degree in Internet Marketing and helps businesses build a 5-Star Reputation online using a system that does not break the TOS with Google, Yelp or others.